Brown Pelican has short legs, making it heavy and massive. Very long bill is equipped with a pouch of brownish skin in the lower mandible, used for capturing fishes. Head is mainly white, with yellowish crown. Nape and neck are white and brown-chestnut. Face shows bluish bare skin. Bill may be dark or paler according to the place. During breeding season, white parts turn a vibrant yellowish-gold color. Upper parts are grey, streaked with brown, contrasting with dark brown underparts. Legs and webbed feet are grey-black. Juvenile is dark brown overall with white underparts. It reaches its adult plumage at about three years. Brown pelican is usually silent away from breeding colonies. Adults utter low, hoarse display calls. Brown Pelican, with its typical silhouette, lives in deserted islands, lagoons, quiet ponds and mangroves. It is resident in warm coastal waters, spending most of its time on rocks above the sea. It rarely ventures inland and remains mainly close to the shores. 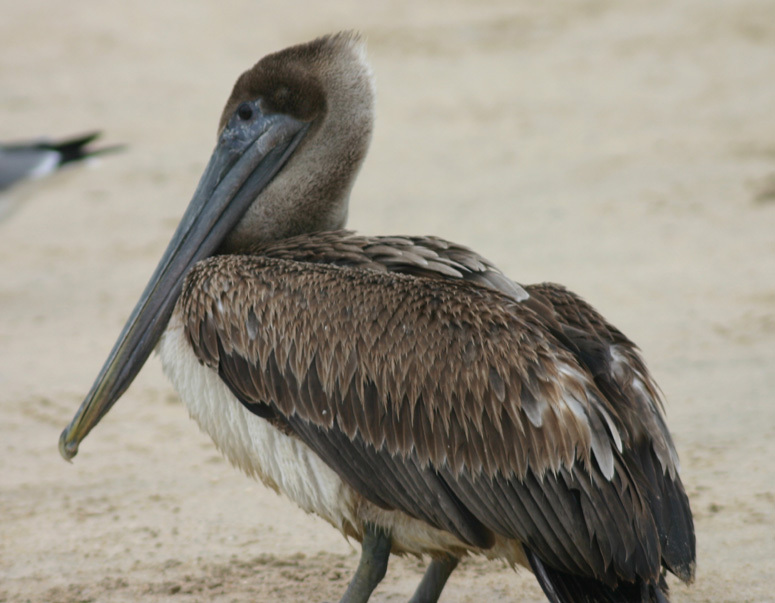 Outside of breeding season, Brown Pelican form groups of up to 50 birds, roosting and fishing together. During nesting period, they may be more numerous. Brown Pelican copulates at different periods of the year, according to the place where it is living. In order to attract a female, male performs courtship displays. It is a kind of dance. 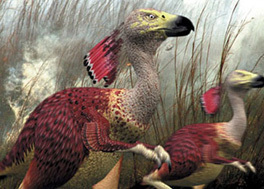 Its webbed feet are pounding on the ground, and it draws a circular trajectory around the female. During the breeding season, the pouch changes of color and bill becomes yellow. Brown Pelican is sedentary. It is gregarious all year round and lives in groups. Brown Pelican often flies in groups, with head retracted into shoulders, and bill resting on the folded neck. They may fly in V formations, but they often form regular lines, or single undulating line. Despite its heavy appearance, Brown Pelican's flight is well sustained. This species may remain on wing for several hours, and also mount to great height in the air, in order to perform beautiful displays. speeds. They fly in perfect silence. Reproduction starts in spring, or later if fish is not abundant enough. Brown pelican nests in colonies, on the ground or in trees. Male settles down on the future nest-site where it performs displays, leaving it only for performing short flights in order to attract a female, and until a female is attracted. Copulation occurs in this place, and then, male searches for small twigs and other nest materials which brings to female with some ritual. It usually chooses an isolated place on red mangroves or in trees and shrubs in deserted small islands, at about 1,5 to 5 m height, sheltered from predators and men. It devotes much of its time and energy to building its nest. It builds a flat structure with twigs, with a depression in the middle for the eggs. Between February and August, female lays two or three eggs, brooded by both parents during 4 to 5 weeks. Brown Pelicans incubate their eggs with their webbed feet. With the thinness of the shells, this peculiar incubation method may crack the egg shells. Altricial chicks hatch naked, but get a thick down at about two weeks of age. Parents feed them with pre-digested fish. Brown Pelican feeds mainly on fish, but it may consume crustaceans, worms and organic wastes. It is mainly a fisher bird. Methods of fishing vary according to the species. Brown Pelican dives head first, from an approximate height of 7 meters, in the right place where its prey is. The pelican's pouch being extensible, it may sometimes get too much food, and it can't take off. It has to reject part of this food, in order to be able to take off again. Occasionally, Brown Pelican may also eat carrions and remainders of dead animals. Some of them may even eat pelicans from close nests, especially if they are sick or injured. Brown Pelican is endangered species. Pelicans consume pesticides contained in water, and absorbed by fishes. Pesticides affect the egg shells. Shells are too thin to produce healthy chicks. Today, they are still considered as endangered, but with reduced use of DDT, threats are less important. Human disturbances and dogs on nesting sites are also becoming a problem.